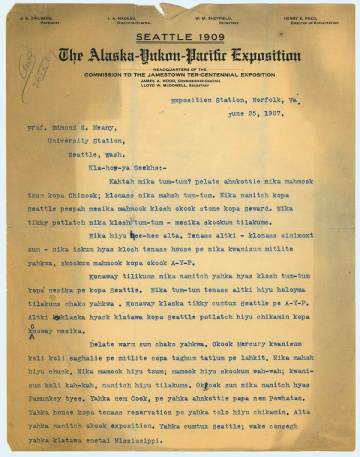 James “Jim” A. Wood‘s letter in Chinook Jargon to Professor Edmond Meany, June 25, 1907, regarding the upcoming (1909) Alaska-Yukon-Pacific Exposition. 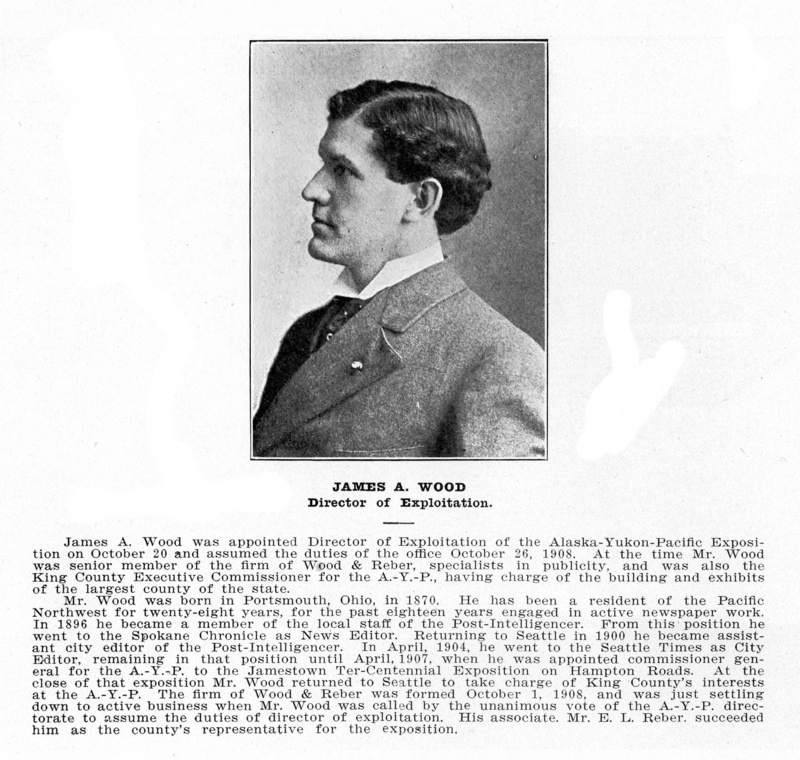 Jim Wood was the city editor of the Seattle Times and — how Western is this — Director of Exploitation for the AYP. 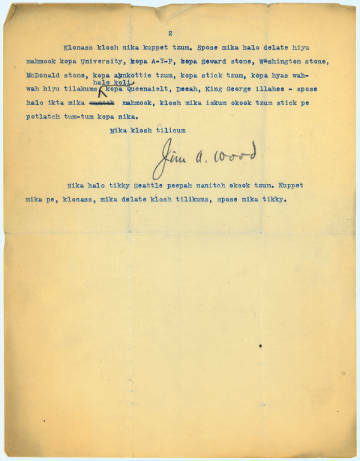 Also uber-Western is the quick repurposing of land once developed; the AYP fairgrounds became the University of Washington campus, where the archive holding this letter now stands. Now to the letter itself. Since we’ve established “Western” credentials, we can expect white people to occupy the stage. And true to form, any letter typewritten in 1907 (there’s a recent and expensive invention for you) is likely to be a couple of powerful white men chatting. So we won’t expect street Chinook here. That said, I’m impressed with the uniqueness and variability of Jim Wood’s spelling, and his command of certain reduplicated forms. (Look for those.) I think the man learned his Jargon the old-fashioned way, by talking it, although we can see he was familiar with the incipiently standardized spellings used in widely circulated dictionary booklets. tikky potlatch nika klosh tum-tum – mesika skookum tilakums. yahkwa, skookum mamook kopa okook A-Y-P.
tilakums chako yahkwa. Konaway klaska tikky cumtux Seattle pe A-Y-P.
people will be coming here. Everyone wants to know [about] Seattle and the A-Y-P.
Pamunkey tyee. Yahka nem Cook, pe yahka ahnkottie papa nem Powhatan. Pamunkey [Viriginia tribe] chief. His name is Cook, and his long-ago [grand]father’s name was Powhatan. mika pe, klonass, mika delate klosh tilikums, spose mika tikky. Some of his spelling seems different, very genuine. 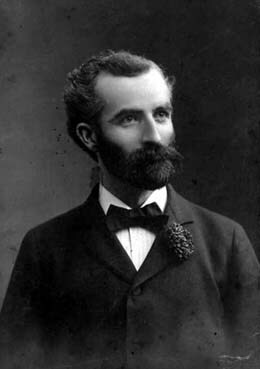 holoyma, kuppet, tilakums, consegh, etc. tenass, klonass spelling indicates second syllable emphasis? altki indicates lateral fricative? Yes, sharp eyes there, Sam! If you do a search on these spellings online (Google, Google Books, Google News), you’ll get confirmation e.g. that there is no Chinook “holoyma” other than Jim the Exploitation Guy’s. Ditto “consegh”, “kuppet” and so forth. Novel spellings are one indicator of real-world Chinuk Wawa experience, back in the day. There seems a reasonable chance that the doubled-s in “tenass” and “klonass” does represent stress. Dave the Greek puts the likelihood at 66%. Like you, I take the “lt” in “altki” as the voiceless lateral fricative /ł/. You find “lt” in free variation with “tl”, “lth” “hl”, “lh”…am I forgetting some spellings?